One good thing about the rainy season is that time usually spent watering the garden can now be focused on writing and cataloging. Given that I don’t have formal botanical training, my favorite way of identifying plants is to post pictures on flickr’s various “ID this plant” kinds of groups. 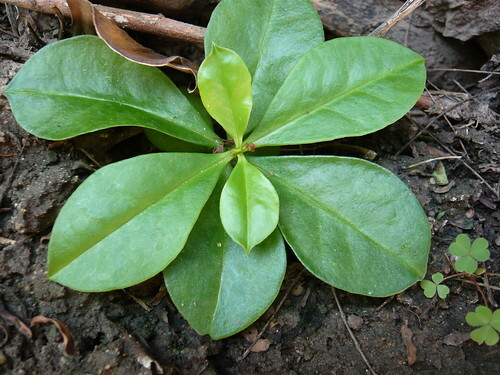 For example, I never knew what this common office or house plant was called. There are two varieties in the garden. 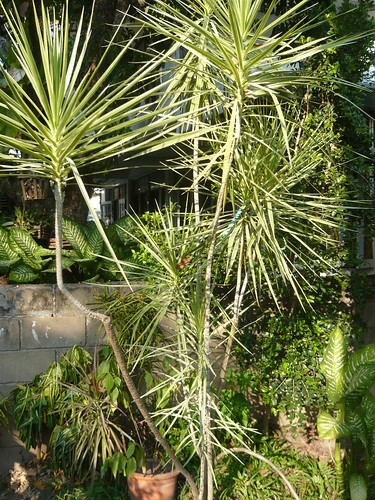 Turns out it’s a Dracaena species in the Asparagaceae family. This is one case where increased knowledge of the plant has not led to greater appreciation, except the realization that it can be sculpted and bonsaid. This Beaumontia, Sp (below) likely brevituba given its rather stubby flowers, is one of the kings of the garden. 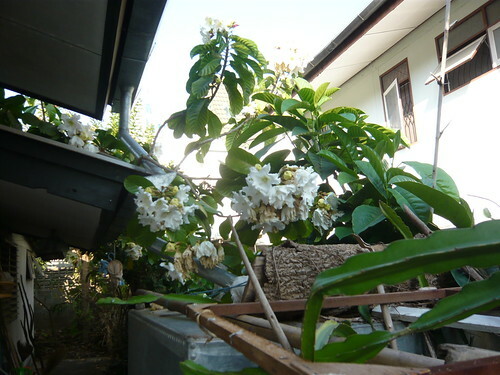 It is also known as the Nepal Trumpet Flower and the “Easter-lily-vine”. It smells amazing. This Beaumontia species came with the house. The landlord remarked about how expensive this vine was eight or ten years ago when she planted it. Now it’s fairly common around Chiang Mai. It likes to grow up trees and onto roofs. After two seasons of letting it grow wildly, we had to cut it off the roof because the branches were too heavy for the very fragile roofs of our subtropical house. A very active climber with white sap and originally from India, the Wikipedia entry describes Beaumontia as “very showy when in full bloom” and “regarded as among the most outstanding vines of the world” and describes them as “rampant climbers.” Very rampant and showy indeed! 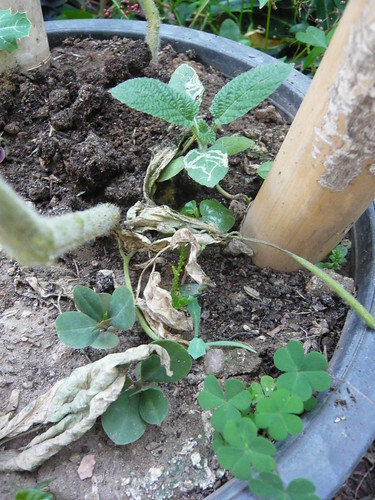 I made a flower essence from the leaves when we cut it back, but the essence is starting to turn sour after one week. I don’t know much about flower essences, but apparently technically one is supposed to use rainwater and moonlight. I used bottled water and sunlight. Maybe I’ll try again with filtered water and moonlight. Maybe it then needs to be sanitized to avoid growth of bacteria and things. Nothing too special about this Hemigraphis species (above) in the Acanthaceae family, now growing like a weed in my Thai garden after the landlord brought the plant over in an ornamental display. I haven’t been able to find any medicinal use for it. Sometimes I just want to know what the weeds growing in my tomato pots are. 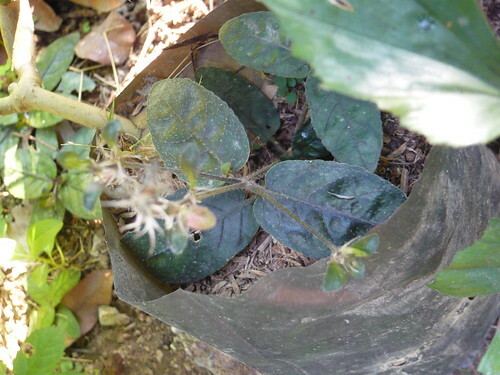 This plant below seems to be Heliotropium indicum (Borraginaceae). The plant is beautiful as a flowering adult, but the seeds that grow from those flowers are plentiful. It has a variety of traditional medicinal uses and contains toxins as well that make me question whether to ingest it. I’m drying a large specimen that I pulled from the taro bed. Definitely need a bit more information and a knowledgeable guide before any human bioassays can be attempted. Writing about these plants and sharing knowledge, even in my rather uncategorized way, just sharing as a passion at this stage, helps assuage my slight guilt at “crowd sourcing” these plants. Until I learn how to ID plants better myself using a taxonomic key, this seems like the best approach. On the other hand, the people who identify these plants seem to enjoy it and seem to compete with each other to see who can answer first, and I appreciate the help of these plant experts. The world could use more plant experts. Until then, plant enthusiasts are here to sing their praises. Singing praises all while looking out for scary things that may pop up, like Scolopendra subspinipes, a rather gruesome manifestation of the centipede. 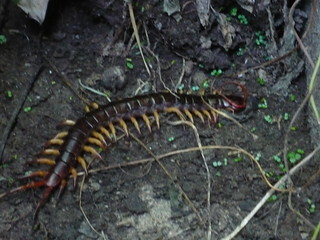 This creature below probably moved into my yard long before I did. I left it alone out of respect, even though one bite can immobilize ones arm. No deaths have been reported. Bad mosquito karma I can handle, but I don’t want to mess with the centipedes. They seem to have the potential to show up in nightmares. Not wanting to leave on a sour note, here are some pictures of Talinum paniculatum (dirt ginseng) in all their glory. 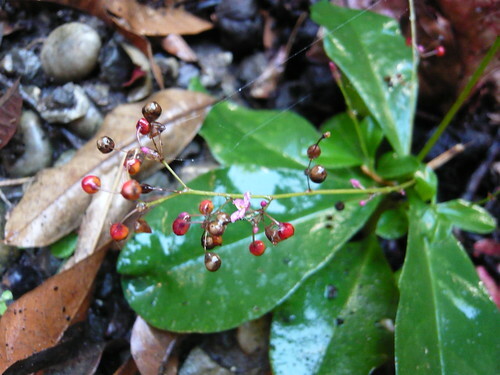 A relative of spinach, this invasive species is tasty and nutritious It’s also known as the “jewels of Opar” because of its bright red seeds. Crowdsourced identification of some garden finds is licensed by Farmer Jack under a Creative Commons Attribution-Noncommercial-Share Alike 3.0 United States License.